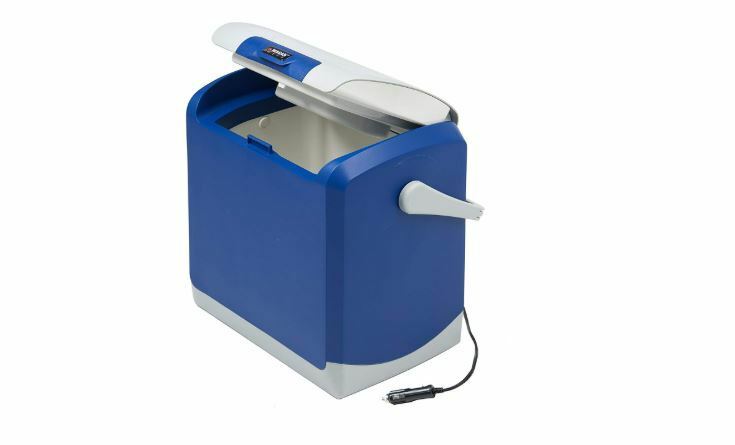 The Wagan EL6224 is a 24-liter thermoelectric cooler that can also warm whatever you put into it. It’s big enough to hold 27 cans or four 2 Liter bottles yet compact enough to sit on the floor or seat of your car. It’s perfect for road trips, camping, and long drives. You can also use it in a boat or RV. In terms of cooling power, Wagan EL6214 is not powerful enough to freeze foodstuff but will keep cold/frozen drinks and foods perfectly chilled. 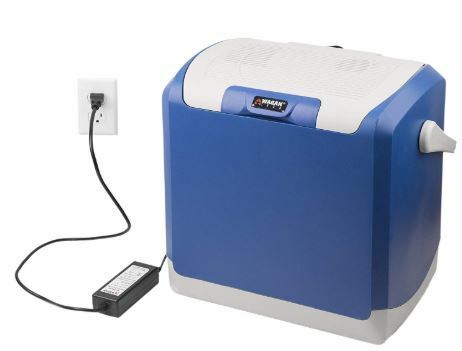 Read on for our full review of the Wagan cooler and warmer. If the Wagan EL6224 cooler doesn’t meet your needs, see other compact 12V coolers we have reviewed in our thermoelectric coolers and ice chests buying guide. Like most thermoelectric coolers, the Wagan EL6224 is a 2-in-1 cooler plus warmer. Most of the time, you’ll only use the cooling function. But by flipping a switch, you can warm your food to a toasty 140F. This is handy if you want to keep takeout food warm on the road, warm up your picnic lunch or warm up the baby’s milk. Unlike compressor-run mini-fridges, the Wagan cooler uses a very small component to do the cooling job. The only moving part is a small fan at the top that helps remove heat from the cooler. This makes it incredibly hardy and durable. There are users who have been using their cooler for years without a problem. Thermoelectric coolers like this one are also more convenient than an ice chest in several ways. You don’t have to add ice, and there’s no risk you’ll find your food wet and soggy. This Wagan cooler will not cool as well as a compressor-driven mini fridge can. If you place warm food or drinks into it, it will take a few hours to chill them. You can forget about freezing food from room temperature, too. That said, if you start with already-cold or -frozen food and drinks, the Wagan cooler does a great job keeping them cool & frozen. In cooling mode, this Wagan cooler maintains an internal temperature 36F below ambient (external air) temperature. In most places, this is enough to keep the inside chilled. Even if you leave the cooler in your hot car for a couple of hours, you'll still find your drinks plenty cold. The cooler comfortably fits four 2-liter bottles in it, even though the narrow + tall design remains compact enough to fit on the floor of your car. One thoughtful feature we love is the extra-long power cord that plugs into your car’s 12V socket. This gives you the freedom to place the cooler where it is most convenient without worrying whether the cord will reach the outlet. You can place it in front next to you, behind the passenger or driver’s seat or just behind the center console where you can easily reach it. When you are not driving, you can plug the cooler in any 12V outlet like a solar generator when camping. 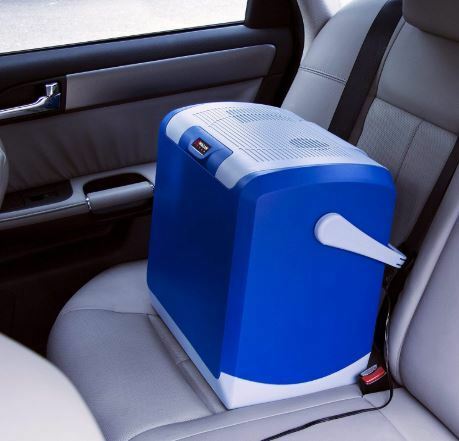 You want a large and compact thermoelectric cooler for road trips, long drives, and camping. You want a maintenance-free cooler. You also want to warm food. You need an extra-large cooler for a big family or group. 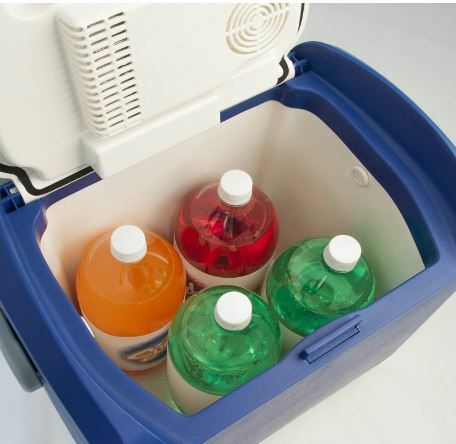 You want a cooler that can quickly freeze or chill warm/room-temperature items. We recommend buying a compressor-driven mini-fridge/freezer instead.